Solving a budget constraint problem in economics - FreeEconHelp.com, Learning Economics... Solved! This post goes over how to solve a variety of questions focusing on budget constraints and how to manipulate them. Answer the following questions based on the table. A consumer is able to consume the following bundles of rice and beans when the price of rice is $2 and the price of beans is $3. How much is this consumer's income? 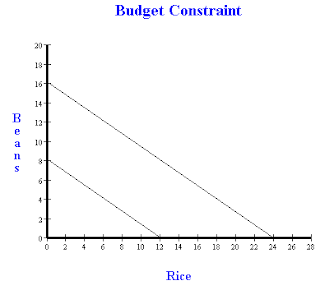 Draw a budget constraint given this information. 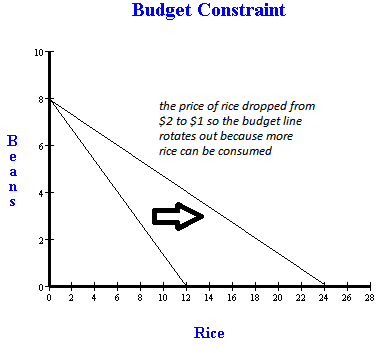 Label it B.
Construct a new budget constraint showing the change if the price of rice falls $1. Label this C.
Given the original prices for rice ($2) and beans ($3), construct a new budget constraint if this consumer's income increased to $48. Label this D.
First we have to figure out his income, to do this we multiply the quantity of each good consumed by the price, and hopefully the total amount (his income) will be the same for each possible distribution. For the first point we get, 12*2 (amount of rice times price of rice) + 0 (since no beans were consumed). This gives us $24. For the second we get 6*2 + 4*3 or $24, the same as before which is good. The last point gives us 8*3 which is also $24, so we are confident is saying that the consumer has an income of $24, which will also be his budget constraint. Next we have to draw a budget constraint, since the prices are constant (they don’t change) the line will be straight (no weird curvature). We then plot these three points on a graph, and connect the dots so to speak and we will have our have drawn our budget constraint. 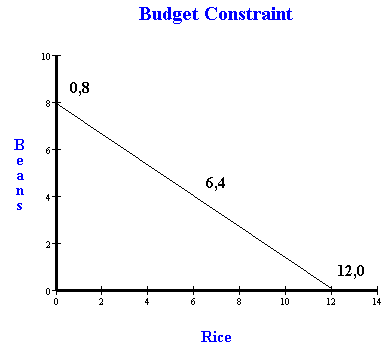 Note that the budget constraint intercepts the axis at 12,0 and 0,8 which is where the entire budget is spent on rice and beans respectively. Now we are given a price change in rice, it moves from $2 to $1. This means that we can purchase and consume more rice. In order to figure out the maximum amount of rice that can be purchased, we must divide our income ($24) by our price ($1) so we get (24/1=24). The maximum amount of rice the consumer can now purchase is 24, and the maximum amount of beans is still the same. 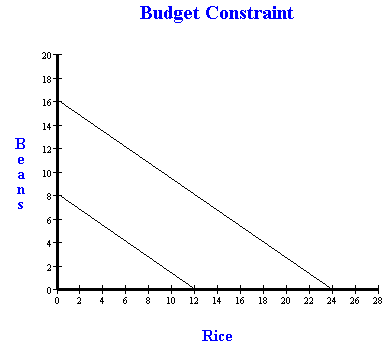 In order to show this on our graph of the budget constraint we move the intercept on the rice axis over to 24. We don’t move the intercept for the bean axis because the price of beans hasn’t changed. Finally, given the original prices, what happens if the consumer’s income increases? The easy answer to this question is to find out how much the income has increased by, and multiply the total amount of goods consumable by the same amount. For this example, income has doubled, so we can simply double each of the goods as well. But let’s go through the math to show why this is true. This has been extremely helpful. It's quite simple to understand. Thank you. In a graph with OG on the vertical axis and Food on the horizontal, what is the Food-axis intercept? How does the budget constraint shift if the consumer’s income level and the two prices all double?